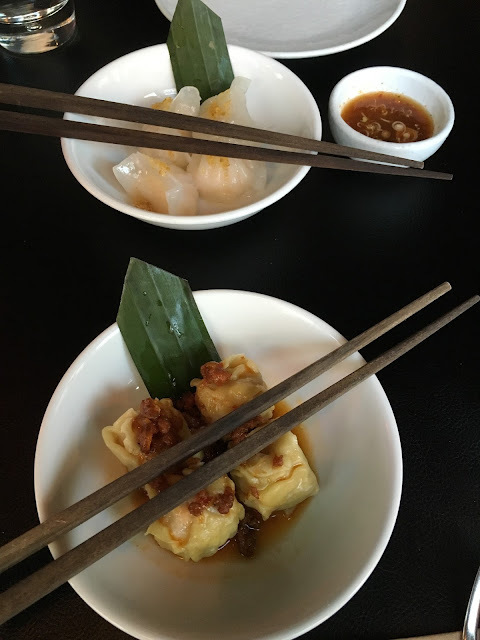 The best Thai in London? Suda Thai Restaurant and Cafe! 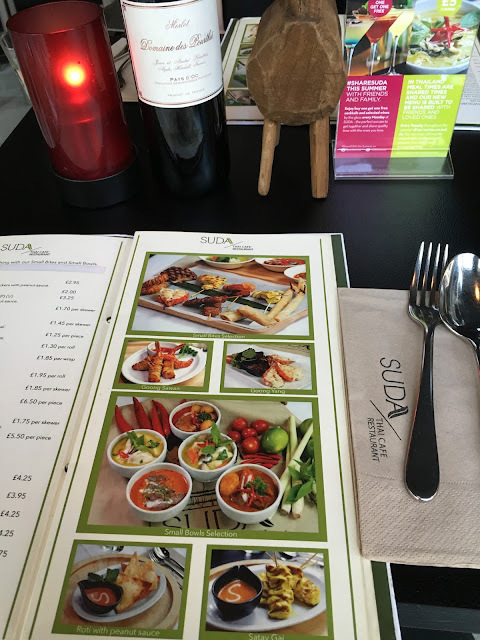 On a mission to discover the best Thai in London, I was delighted to be invited to Suda Thai, winner of the Open Table Diners Choice Award, situated in the heart of Covent Garden, London. And it seems I was not the only one exciting to try out the delicious menu, as when whatsapping my plus one, Emily, the night before, she was just as enthusiastic as me about the delicious looking offering. Spotting on their website that SUDA's menu is based around "sharing bowls and bites, allowing you to discover and explore the best of Thailand", Emily's interpretated this in my kinda style.... "We can share one of everything!". 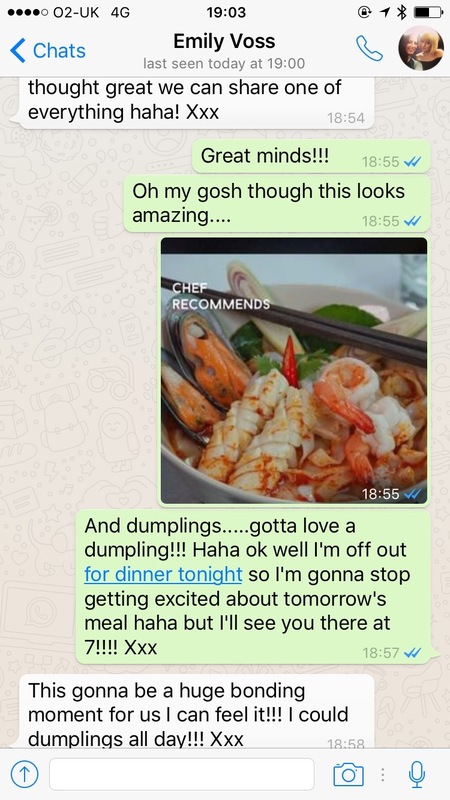 As well as recognising our shared loved for dumplings - "This is gonna be a huge boding moment for us!". As we walked up Covent Garden one sunny Saturday evening, we were greeted at the door by the friendly waiter and asked where we would like to sit. 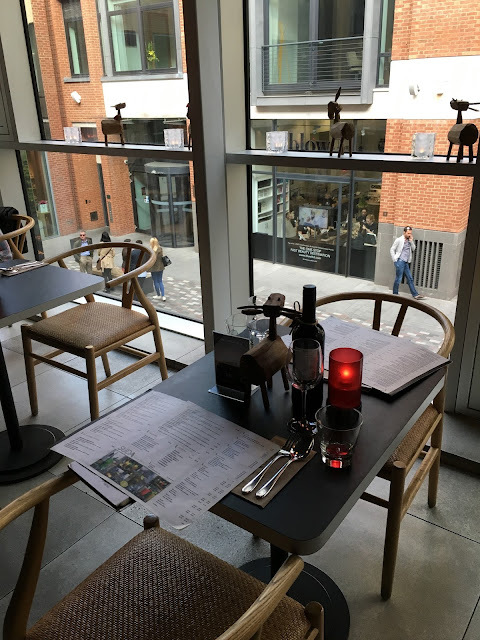 Whilst they do have a lovely open outside courtyard, we decided to go upstairs, where we had great views out overlooking St Martins Courtyard, and sat down to our table set with cutlery, candles and a cute little donkey. Random, but we loved it! Glancing over their impressive cocktail menu, with options including "Butterfly Kiss", "Mango and Papaya Drop" and various different mojito flavours, we went the most pink and girly option on the menu....to match our lipsticks of course. Me and this girl - likes peas in a pod! Looking at the menu, which brings together the greatest hits of Thai street foods, we were a little overrun with choices.... in the best way! From appetisers, starters, small plates and sharing dishes, to vegetarian options, stir fries, chef recommendations, curries, thai soups, grills, salads and sides - I never knew a menu could have so many different components! The starters, however, were easy given we'd already decided on DUMPLINGS! As the "Pan Sib" - a traditional Thai steamed fish appetiser - was unfortunately unavailable, we went for the other two options on the menu - "Goong Takrai" - a homemade prawn and lemongrass dumpling served with "yum" sauce, and "Kanom Jeeb" - a steamed pork and chicken dumpling with Suda sweet soya sauce. Oddly, we were told this is actually traditionally a Thai "morning snack" - although I can't imagine tucking into it at 11AM, it was a delicious way to begin our Thai meal! The nice thing about dumplings to start is that they are quite light, meaning we had plenty of room to enjoy our mains! 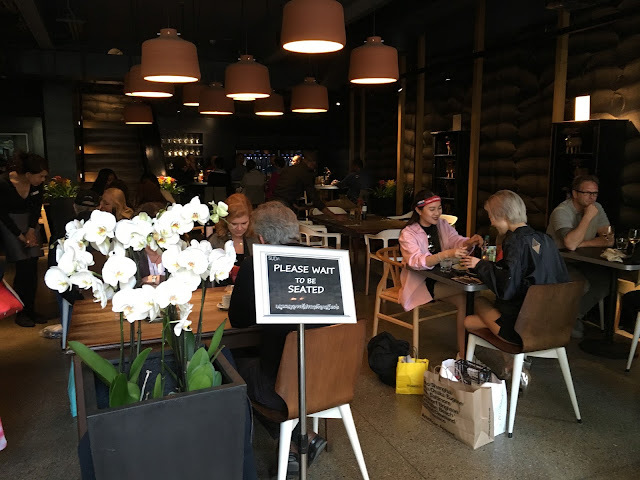 We seemed to have forgotten about the "dishes for sharing" concept at this point, as temptation got the better of us and we picked from the "Each to His Own" section of the menu - i.e. bigger dishes, for those who don't want to share! 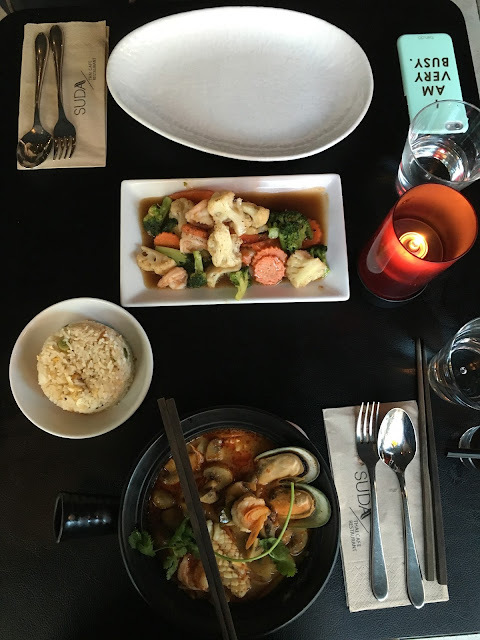 I decided to go for the chef recommendation - Guay-Teow Tom Yum Seafood - a classic spicy tom yum noodle soup with king prawns, squid, mussels, mushrooms, and fresh Thai Chilli to garnish. Although meant to be only mildly spicy, it certainly had a punch to it.... although I am a bit of a woose when it comes to spice so no doubt others may disagree! Despite the chilli kick, the delicious flavourful notes of the broth that coated the delicate noodles was lovely and, whilst the dish was perhaps a little light on the amount of seafood, what was there was deliciously fresh and cooked to perfection. Emily, meanwhile, went for the Goong Pad Pak Ruam, stir fried prawns with mixed vegetables in a sweet soy sauce, along with a side of egg fried rice. An essential, of course! This time, there was no skimping on the fish, and her plump and juicy prawns seemed to be a winner. When it came to deserts, usually I wouldn't go for one in a Thai restaurant as I've found oriental desert options can often be a bit more unusual (I'm still a bit traumatised by my deep fried ice cream at Lotus Indian!). However, it wouldn't be fair not to review Suda's third course (or that was our excuse anyway! ), so we decided to take a little look at the menu just to see if there was anything that would take our fancy. No surprise - there was! 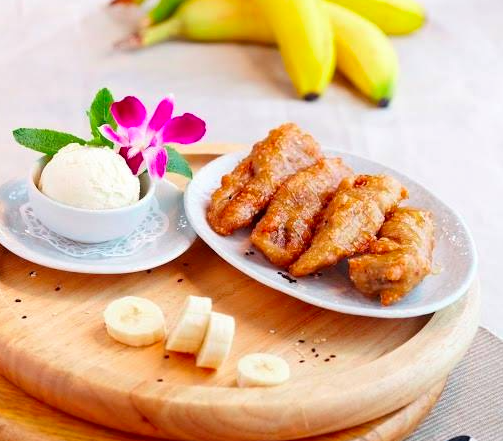 Gluay Hom Tod - Banana Fritters with honey and sesame - apparently a speciality! As expected, with options like the one above, the menu was slightly more unusual in comparison to your traditional British sticky toffee pudding and apple pie, but just as tempting.... if not more! Rather full from her main, Emily decided to go for the safer option of Sorbet Pollamai, Mamuang - or, to you and me, a refreshing Mango sorbet. I, meanwhile, decided to be a bit more adventurous and ordered the "Kao Niew I-TIm Ka-TI" - sticky rice and homemade coconut ice cream with condiments. 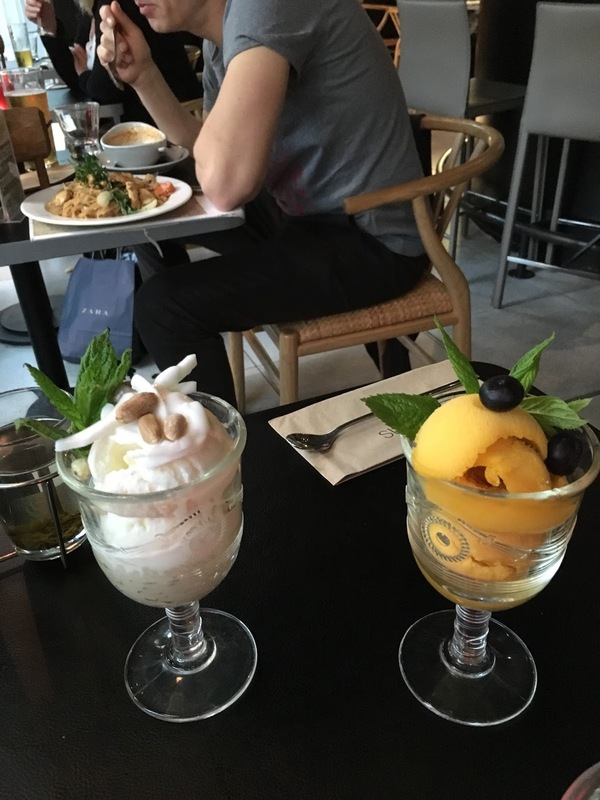 To be completely honest, it was really just the homemade coconut ice cream I was after and, whilst I was intrigued by the idea of sticky rice in a desert, I didn't necessarily think I would enjoy/eat that part! Well, I'm happy to admit I was very wrong - in fact it was strangely delicious! Not like rice pudding in the slightest (the mushy texture of which I really can't bear), the rice still had the perfect amount of bite to it, and was a lovely mix of sweet of savoury when blended through the ice cream. Very happy I decided to venture out! Suda Coffee - not quite what I expected! What was more unusual and unexpected, however, was my Suda Coffee - which came in a cute carrying frame with two glass cups , one more reminiscent of a herbal tea than my usual thick brew courtesy of Starbucks! When I asked if this was the coffee, they laughed at me as though I'd just asked the most obvious question in the world. Seems this is how they drink it in Thailand! 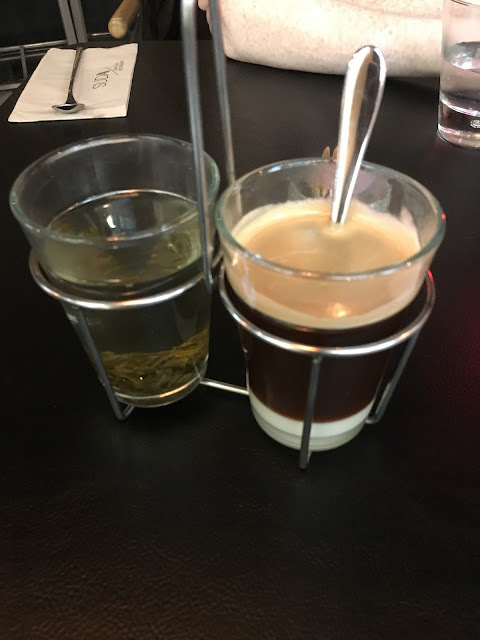 They explained, in the first cup you have a freshly brewed black coffee, sitting above a layer of sweet condensed milk, and the second glass a jasmine tea, provided as a chaser. An authentic coffee experience I never even knew existed... Starbucks, you have a lot to answer for! Overall, we had a fantastic time at Suda and, even after all our plates were cleared, we stayed chatting away for a good hour afterwards - it was only when we looked at our watches did we see it was 11pm, and we'd been there for 4 hours! 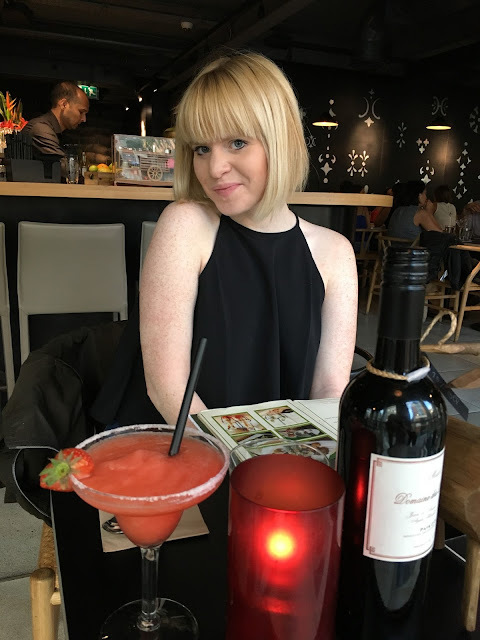 A three course meal for two would cost around £50, drinks excluded. 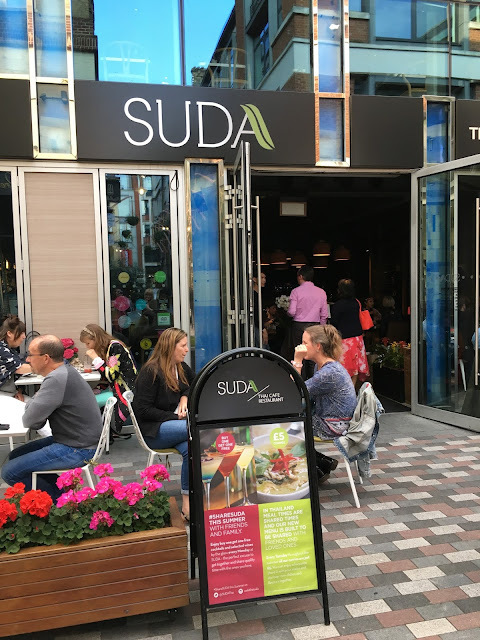 To be completely honest, the food was fine - not fantastic, but tasted fresh, was satisfying and reasonably priced - but what really made Suda stand out was the exceptional and efficient service, ambient atmosphere, and beautiful boutique style decor. So, whilst they are many additional perhaps more authentic Thai restaurants in London, I can sometimes be a bit wary of walking into the slightly unknown.... as usually the food images on the board outside and somewhat basic decor can be questionable! 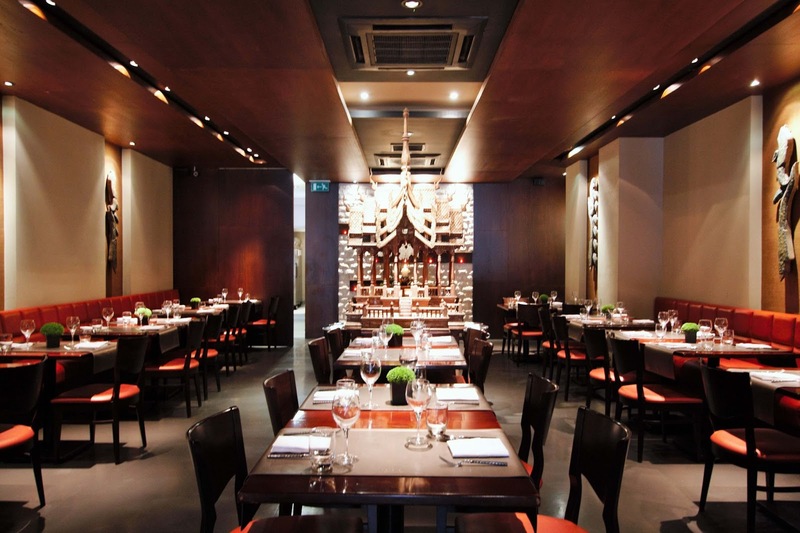 Interior - when there's Thai people dining in the restaurant, you know you're in for a good experience! With Suda offering exactly what it says on the tin, in a pleasant, buzzy and modern environment, you know it's a experience you will enjoy. With their large premises and central location, it's the perfect option for a big group of friends to catch up over an easy meal and drinks. But don't take my word for it, give it a try and let me know your thoughts.! 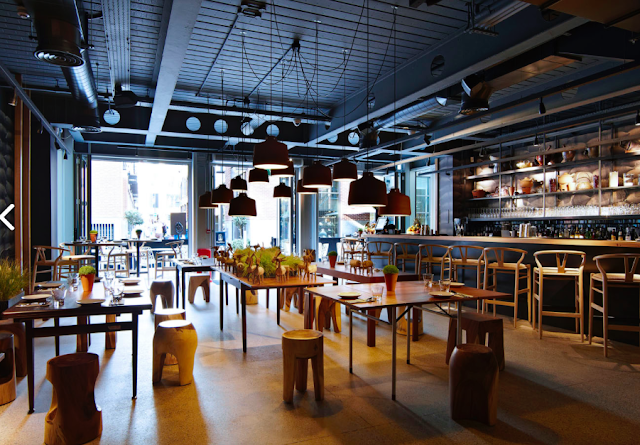 Or, if you're fancy a more upmarket dining experience, why not Suda's more formal sister site, Patara. With a flagship Soho, and 5 other London locations in addition to restaurants in Geneva, Bangkok, Singapore, Beijing and Vienna, this one is certainly next on my list to try in my hunt to find the best Thai in London!